Many companies have a name rich with meaning and personality to represent their brand. Ours is no different. Not only does the name ‘Shogun’ represent what our company stands for, but it helps drive our culture and the authenticity of the food we offer. 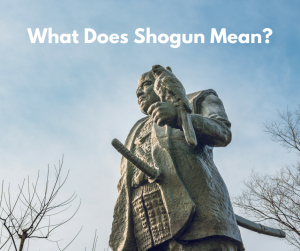 Shogun is short for ‘Seii Taishogun,’ which translates to “general who overcomes the barbarians.” Between the 8th and 12th century, Shogun was the title offered to chief military commanders. Soon after the end of the 12th century, the title Shogun was given to the military ruler of Japan, and through their military control they held unquestionable authority over the Japanese territories. The title of Shogun is one of prominence and respect, and at Shogun Japanese Steakhouse we make it our goal to earn those same accolades through excellent service and top quality food. In our endeavor to continue the tradition of respecting the title of Shogun, we also seek to provide authentic fare for our customers. If you are looking to enjoy a true Japanese steakhouse experience, then look no further than Shogun Japanese Steakhouse. Our fresh sushi and delicious authentic dishes are truly a treat for the senses, as we will stop at nothing to ensure the best meal for you. Call us today at 407-352-1607 to reserve your table.